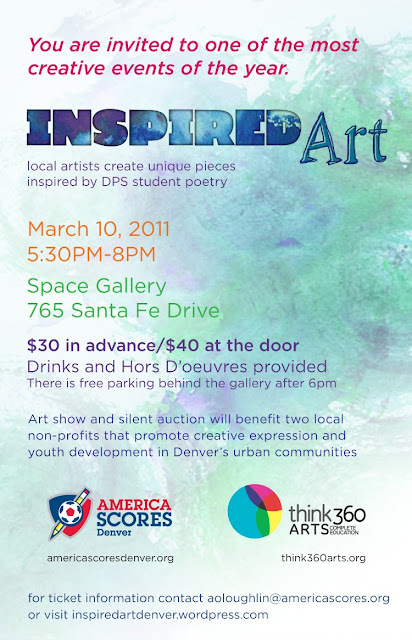 March 01, 2011 in "Abstract Expressionism", "Acrylic on Canvas", "America Scores Denver", "Denver Public School", "I Wish", "Illustrated Poetry", "Inspired Art"
Acrylic on Canvas with Pencil Drawing and Gold Leaf, 24 x 24"
I was inspired by Christian's courageous use of poetry to express his feelings. In essence it's what I try to do every time my paintbrush touches canvas. My vision was a abstract expressionism painting to convey the poems words. It's hard to imagine any image illustrating the broken heart of this child. I started by embodying the emotional words, using red, blue, and yellow to suggest heartache, a ocean, and wishing upon a star. I felt like a fraud painting someone else's emotion. It just didn't feel right. To me, it needed the main character, mom. It doesn't sound like he knows what his mom looks like, so I drew a generic female face. 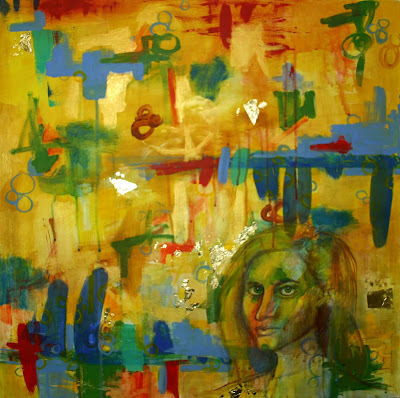 It gives the painting a focal point and represents the main character. Painting is always a process. The event details are on the right.